Lots of people came to eat and drink and dance and sing this weekend. We did Thurs-Fri-Sat; by very special request. There were birthdays, engagements and fathers' day celebrations. A big thank you to my son Fabian who worked on Saturday, the night of his 17th birthday. I didn't ask them to pose. Clearly all my guests are naturally photogenic. This is David and Theresa and family (from The Only Place for Pictures in Palmers Green). They're eating my chicken with cream and sherry casserole with braised baby gem and pots en pap (potatoes cooked in a paper bag). Sam and Gill have a special reason to be smiling... but it's not mine to divulge. That's the pots en pap in the foreground, next to Rob's elbow. Theresa *may* be posing a little here. Becs dancing (with her brother Sam). One of the things we served this weekend was slow roast pork belly (again with potatoes en papillote). I was asked for the pork recipe. I'm very pleased with the dish because it is my own*. The asterix is there because, in cooking, nothing is *new*. We all build on the experience of others. Pork belly with savoy cabbage, rosemary gravy and parsnip & apple purée. Slow roast pork belly - serves about ten. Buy a 3kg pork belly. This will necessitate a trip to your local butchers, hopefully not for the first time. Don't bother with the supermarket; you'll be needing a butcher not just someone who unwraps meat. Hey, while you're there, see if they have any beef shin, or ham hock. Maybe some oxtail and marrow bones for stock? They're not in this recipe but you'll thank me when you get home. If you're used to those prissy little plastic supermarket packs, the size may shock you. Worry not. We can do this. Ask the butcher to leave the belly on the bones (ribs) but maybe loosen them a little.Preheat the oven to 230°C. You need a baking tray large enough to lay out the belly but that will also fit in your oven. Put this on the hob. Fill with boiling water to a depth of a centimetre. Place the belly SKIN SIDE DOWN in the water and boil for 15 mins.This will soften the skin without cooking the meat. Remove the belly from the tray and place skin side up on a clean J–cloth or towel. You should now be able to score the skin finely. You'll still need a sharp knife. Dry the skin off completely. Now rub in some neutral tasting oil - grapeseed or groundnut is good. Grind just less than a tablespoon of fennel seeds with the same amount of sea salt and rub this into the skin. You can rub in other stuff too: sugar, honey, allspice, cinnamon but I prefer to let the pork sing solo. Tip the water out of the baking tray and replace the belly on a rack in the tray. The rack is important. Cook in the very hot oven for 15-20 mins until the skin starts to blister. While that's happening, cut up four carrots, two sticks of celery, two leeks and two onions. The exact amounts really aren't critical. What's a good fistful of rosemary? This is. Now turn the oven down to 160°C. Place the veg under the pork (it's on a rack, remember?). Pour in at least 200ml of white wine, vermouth, apple juice, stock or water or a combo of any of these. Take a care though as this will be the basis of your gravy. 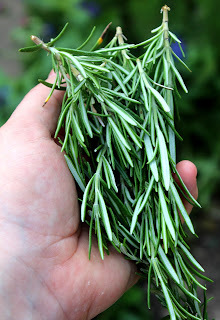 To the now wet veg add a good fistful of rosemary. And I really mean a good fistful. Roast this (uncovered) for at least three hours. It could be four or even five - in which case, drop the oven down to 150°C. The meat won't really suffer because there's so much moisture in the fat. Top up the tray liquid if it starts drying out - and it will. Don't let the veg burn or your gravy will be acrid. The meat will be very tender, the fat should have rendered off into the veg below and the skin should now be glassy and delicious. Remove the meat and allow to rest while you sieve the veg and pork juices into a pan. 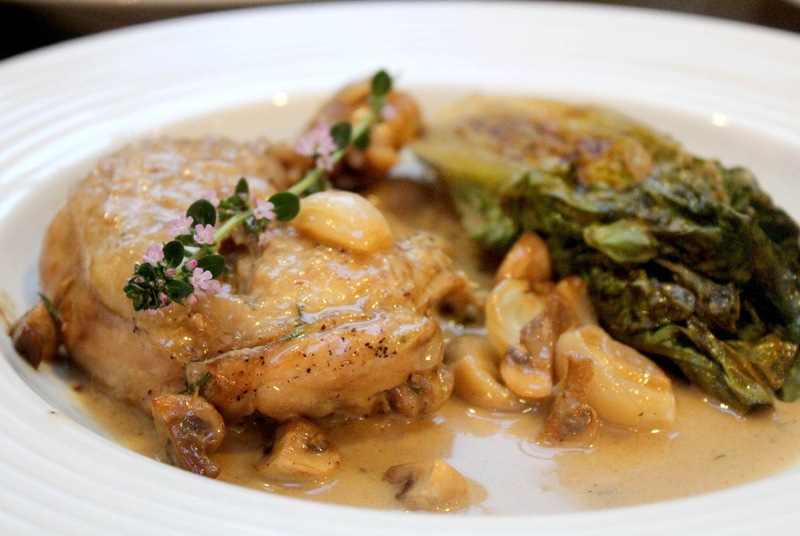 Season the gravy, thicken it if you like (with cornflour or beurre manis). I whisk in some ice cold, cubed butter right just before serving - if you do this, the gravy shouldn't be boiling. You'll also probably want to sweeten the gravy too. A pinch of sugar is an obvious choice, but you could use redcurrant jelly or honey or even something like these. I use a home-made rosemary jam... but I would. I serve the pork with parsnip and apple puree, some sort of cabbage (green or red) and some pots en pap. This is not one to dish up at the table. The crackling needs some serious endeavour and this can look ugly. Hide your industry in the kitchen. Thanks from us all at The Only Place For Pictures. We really enjoyed our evening at your lovely restaurant. The food was fantastic, we'd love to come again.